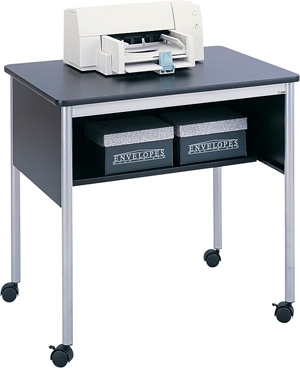 Oversized open design stand was developed for use in printer/copier areas but can easily double as a 31-1/2"W x 24"D work surface whenever the need arises. It rolls easily on four swivel casters (two locking). Large open storage areas features modesty panels on three sides and features a convenient storage shelf. Sturdy steel construction. Black with Black 3/4" laminate top and contrasting Metallic Gray steel legs. Assembly required. Includes Manufacturers Limited Lifetime Warranty.